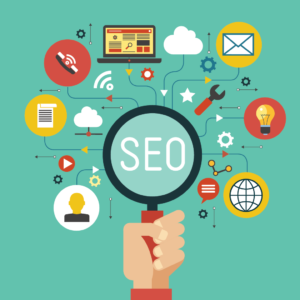 SEO Best Practices to Help you SEO like a Pro! You don’t have to be a digital marketing expert to master SEO best practices. Here are a few SEO Dos and Don’ts that you can start using today. DON’T Choose a long list of keywords that you think your audience should be searching for. YOU are not your audience – subject matter expert, absolutely. However, to be successful, an SEO strategy needs to be focused around the needs of your audience. DO – Develop mini content collections around a central theme integrating keywords that are relevant to your audience. Use a free tool like Google Keyword Planner to choose keywords with a high average monthly search volume. DON’T – Take your brand-spanking new keyword list and stuff them into your content. That’s called keyword stuffing – and you’re better than that. DO – Write high-quality, easy-to-read content. Speak to your audience with authority and work in your keywords when it feels natural. Instead of resorting to keyword stuffing, use different strategies, like using keywords that you want to rank for as anchor text in hyperlinks when linking to additional assets within your site. DON’T – Repeat on-page content verbatim anywhere. Ever. Just don’t do it. DO – Change it up a bit while maintaining your keyword(s) in the text. You don’t have to do a massive re-write, make some edits so the content feels fresh when crawled. To discuss your SEO strategy, contact Pam Turner today. SEO, or Search Engine Optimization, is the art and science of creating and leveraging highly targeted content across multiple channels to attract a specific audience in organic search. SEO also plays an important role in creating brand awareness, providing an outstanding user experience, improving website conversion, and achieving a position of authority in the market. While there are many free tools that can help you choose relevant keywords – like Google Keyword Planner, creating and leveraging an SEO strategy for long-term sustainability requires consistency, analytics, on-page and off-page linking, and intuition. 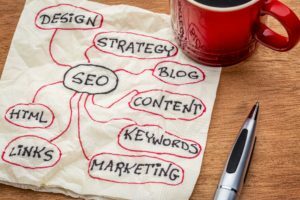 In this blog I will share 3 tips for integrating an SEO strategy when creating website content. SEO Like a Pro with these 3 Tips! You may be the subject matter expert on your products and services, but that doesn’t mean you know what search terms are most popular with your audience. Today – right now. Don’t choose industry-relevant keywords, choose audience-relevant keywords. After identifying your target audience and user personas, consider the pain points you can solve. Brainstorm some ideas and enter them into a search engine to get a feel for the results. Then head over to my favorite free keyword tool, Google Keyword Planner, to nail down a few keywords you’d like to rank for. Check out Neil Patel’s Quick Sprout for a great tutorial on how to use Google Keyword Planner. While I agree keyword density is an important variable in an SEO strategy, I feel it is more important to write high-quality, easy-to-read content with a meticulous linking strategy versus finding ways to use keywords as many times as possible to increase keyword density. It’s called Keyword stuffing – and you’re better than that. Depending on the length of your content, it is generally accepted to achieve 1-3% keyword density. To check your content, try the free tool, Live Keyword Analysis. Since you are likely working with a limited amount of on-page content, one way to boost your keyword in organic search is to use words as anchor text – words in a hyperlink that link to a blog, asset on your site or a high-authority, relevant off-page location. When using anchor text as part of your SEO strategy, make sure the keywords used in the hyperlink are relevant to the page you are linking to. One more time: relevant to the page you are linking to. If you are using WordPress, download an SEO plugin like Yoast and populate all of the metadata fields. Choose a focus keyword for each page of your website. Use the keyword in your H1 header, toward the beginning of the first paragraph, in the meta title, and meta description. Use the focus keyword as anchor text in a hyperlink. For example, choose a group of keywords you’d like to rank for. Write a long-form piece of content – a white paper or an article. From that piece of content create 1-2 blogs and a few social posts – all optimized for the same keywords. Make sure you use the keywords in anchor text when linking from social to your website. Bonus Tip: Graphics are Cool! Always find a way to create an infographic from a piece of content. I call these companion pieces. They are great for social and to use as thumbnails on landing pages. Always keep your audience top-of-mind. Build an SEO profile that is audience-relevant. When you write your content, make sure it is is easy to read. Don’t focus entirely on reaching a specific keyword density ratio. If you use your keywords in a strategic linking pattern you will gain traction in organic search without compromising the value of your content. Finally, Reuse, Recycle, and Repurpose. Write a long-form piece of content and create multiple pieces from it – including an infographic. Contact Pam Turner to discuss your SEO and Go-to-Market Strategy. Pam Turner is a digital marketing professional with nearly 20 years’ experience creating and implementing strategic and tactical planning to maximize ROI, build brand authority, and deliver an outstanding customer experience.